Secondly, Russian importers still buy large quantities of Polish apples and smuggle them into Russia with false certificates of origin, namely Serbian or Belarussian. It is amazing but for the time being Russians consumers are unable to give up Polish apples as they are the most easily available as well as the cheapest in the market. Banned Polish apples are reportedly being imported into Russia via Serbia and illegally sold in shops. Moscow has since threatened to impose a trade embargo on Belgrade over the increase in apple sales, which they suspect originate from Poland. Serbia has been given 10 days to respond to the Kremlin's claim. Thirdly, Polish consumers have increased their consumption. From 14 to 16 kilos of apples per head annually. Still not very high compared to others. But give us some time to catch up. Banned food is destroyed by bulldozers and burnt after being discovered on the borders. Russian propaganda posters: Russians don`t want to eat (European food). Wasting food like that in a world where so many are hungry is an outrage! Russia itself has a history of deadly famines which killed millions. Destroying food is considered sacrilege in Russian tradition. But Putin can do practically anything without losing votes, as long as he makes Russians believe they are a superpower again, equal to the USA, this eternal opponent and competitor. 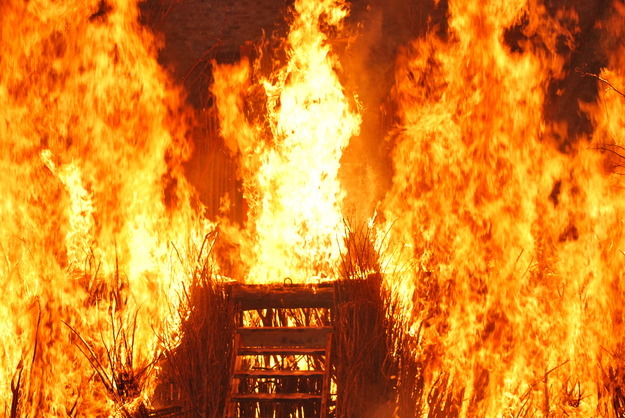 Food will burn - life in illusionary world requires sacrifices! Poland-Russia freight transport in jeopardy? Polish carriers will need to leave Russia on 31 January if a new freight trade agreement between the two countries is not reached by that date. A Polish-Russian committee on international road transport was scheduled to meet on Thursday in the Baltic port of Gdańsk to negotiate a new agreement. But the Russian delegation did not arrive at the meeting, Poland’s PAP news agency reported. “[Russia] has taken various measures, including administrative, whose goal is to eliminate Polish carriers from the Russian market,” Poland’s Deputy Infrastructure Minister Jerzy Szmit said at a press conference. Polish and Russian transport companies have until February 15 to repatriate trucks inside one another's borders, with Warsaw and Moscow deadlocked over haulage permits, local media reported on February 1. The deadline has been extended in order to allow firms to bring their lorries home, after the permits expired at the end of January. The two countries, now led by regimes holding no little antipathy towards each other, have failed to seal a new agreement to allow road links to persist. The pair is set to meet again on the issue on February 1, with a meeting of transport ministers to follow on February 2. The talks are thought unlikely to produce much progress however; the Russians did not show up for the last meeting planned for January 28-29. Warsaw and Moscow have been negotiating rules for some months. However, talks have failed to agree a new batch of permits for 2016. Poland considers recent changes to Russian transport regulations discriminatory, and claims Moscow is carrying out a plan to eliminate Polish hauliers from the Russian market. Moscow’s very strict limits on haulage of goods from third countries into Russia have been tweaked to encompass goods produced in Poland by foreign companies, Warsaw claims. It is a means of gaining a competitive advantage on the Russian market, Polish experts claim, pointing out that Polish hauliers are larger and more efficient than their Russian peers. At stake is an estimated €400mn in annual turnover that Polish transport companies earned last year by moving goods to Russia, according to ZMPD, an organisation of international transport companies in Poland. Russia is no stranger to rifts with its neighbours in the north east corner of the EU, espcially since the Ukraine crisis kicked off in late 2013. Lithuania's vital transport sector has suffered several hits over the past few years as relations have nose-dived. No Offense .. OK maybe that is not True, But Didn't You Poles Want AND Place Sanctions on Russia ... So Surely, Russia placing Restrictions on Your Goods is a Fair Response ?? You Poles are getting More like US Americans (bar 1000) Every Day, thinking that Rules Only apply to Others, But not "Budding Exceptional" Poles !! On February 1, Poland stopped Russian trucks using its territory after a transit agreement expired and Moscow and Warsaw failed to agree on a new one. As a result, Russian trucks traveling from Western Europe were using routes through Ukraine, Slovakia and Hungary. Talks on a new agreement to restore Poland-Russia truck transport are ongoing, but Euronews reported on Feb 15 that borders of Ukraine and Poland remain closed to Russian trucks. Both countries are governed by right-wing, anti-Russia ideologues. BTW, the first truck war in the region happened nearly 3 years ago. Sanctions against Russia are nonsense. What Russia did was taking back Crimea after Ukraine`s new illegal government started ethnic cleansins towards its Russian speaking citizens. Russia was forced to defend her peoples from ethnic persecution which Ukrainians were going to implement after the nationalists had seized power in Kiev. But taking Crimea wasn`t too legal, either. When a country invades the territory of another country with its troops, other countries call it aggression. Fortunately, those other countries showed solidarity and put sanctions on the invader. Russian officials complain that Belarus exports more apples to Russia that it produces. Local production - 100.000 tonnes, export - 500.000. I hope you realise this difference. Polish apple export to the East has returned to quotas achieved before sanctions. It seems Russian authorities decided to close an eye to the Belarusian re-export of Polish apples into Russia. Cheap Polish apples are still the best option for impoverished Russian society. Russians have had enough of being duped by Belarussian exporters. They constantly discover Polish labels on produce which have been allegedly grown in Belarus. As informs the Polish TV channel TVP Info, Russia from February 14 to stop the import of apples from 31 enterprises in Belarus. On such measures, the Rosselkhoznadzor was forced to go due to the fact that Russia continues to receive fruit from the EU, in respect of which it was imposed retaliatory sanctions in the form of a food embargo, in particular, the country is constantly imported Polish apples, which, according to the channel, become for many Russians, a symbol of the “leakage of state borders”. It is emphasized that earlier the Kremlin had already taken similar measures against the enterprises located on the territory of Belarus and Kazakhstan that Russia was the flow of the sanctions. The channel is recalled that the embargo on food products was announced in 2014 in response to Western sanctions that followed the annexation of Crimea. This prohibition does not prevent for the past 3 years to bring to Russia the fruits of European countries, including Poland. Outlined by the Polish side, the scheme of import of the sanctions in Russia looks as follows. Apples from Poland buying intermediaries from Russia, China, Turkey and other countries on the importation of fruit of which at the moment of the ban there, and in Belarus and Kazakhstan imported on the Russian market. It is reported that in recent weeks, the Russian phytosanitary service has tested more than 80 Belarusian companies, 31 of them are unable to prove the origin of fruits and 22 exported apples, although it had no inventory in warehouses. It is worth noting that such supplies are regularly destroyed Russian customs, more than 20 tons of Polish apples was destroyed on 5 February, in the Orenburg region. 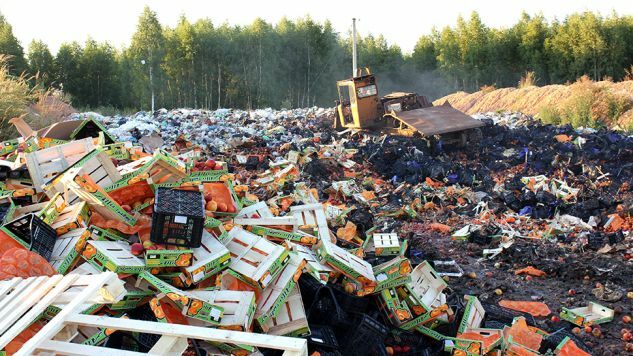 The same number of apples eliminated at the landfill on January 26 in Tver region. This year Polish farmers may miss apple export to Russia from the past. Due to abundance of apples in all Europe and resulting cheap import to Poland, the wholesale prices are below the production costs, so apples are left to rot in orchards. It wasn`t enough and this year Russia has introduced a total ban on any apples from Belarus.